In 1931, Japan had invaded and occupied Manchuria. Throughout the 1930s, China suffered continued territorial encroachment by the Japanese using their Manchurian base. Tensions continued to build as Japan gradually started to take over the whole north of the country. These tensions sparked at the Marco Polo Bridge Incident in 1937. Japanese troops were eventually driven away and the entire incident was considered only a minor skirmish at the time, but this battle served to mark the beginning of the Second Sino-Japanese War. The Battle of Shanghai was one of the bloodiest battles of the entire war. The three-month battle was aimed at stalling Japanese advance towards the Chinese capital. In the end the Chinese retreated and the Japanese continued towards the capital of Nanking. However, the Japanese troops were thoroughly demoralized by the long, violent fight. The Battle of Nanking was crucial for the Japanese since Nanking was the Chinese capital. The Japanese eventually won the battle. China received aid from Nazi Germany for a short period, until Hitler made an alliance with Japan in 1938 purely for military strategic reasons. Hitler also thought Japan would be of aid to the Axis powers in WWII. Shortly after the Marco Polo Bridge Incident, the Nationalists and Communists that were undergoing a power struggle in China agreed to fight side by side against the threat posed by Japan under the Xi'an Agreement. The Battle of Nanking was notorious because thousands of civilians were raped and killed day the battle ended. This became known as the Nanking Massacre. The Nanking Massacre turned many countries against Japan. On December 7, 1941, in response to the US interfering in the war by giving oil sanctions to the Chinese, Japan attacked Pearl Harbor, killing 2,402 Americans and injuring an additional 1,282. 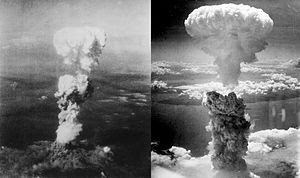 •On August 6, 1945, the U.S. dropped an atomic bomb on Hiroshima, Japan. Shortly after, on August 15, another atomic bomb was dropped on Nagasaki. After this Allied victory in Hiroshima and Nagasaki, the U.S. ordered all Japanese troops in China to surrender, informally ending the Second Sino-Japanese War. On April 28, 1952, Japan and China adopted the Sino-Japanese Peace Treaty, or the Treaty of Taipei, under pressure from the U.S. This treaty formally ended the Second Sino-Japanese War.